We are excited to announce that we will be performing at the Cambridge Bay Coffeehouse on Saturday, November 29, 2014. This is a great fundraiser for the local food bank. We’ll be playing our songs, but we also invite other musicians to come up and perform during the open mic portion of the event that we’ll be hosting. If you’re in Yellowknife this weekend, don’t forget to come to our show at After 8 Pub! We’ve been practicing so hard, our Tiger Moms would be proud. It’s going to be a great show. Don’t miss it! Finally, a huge thanks to Jeff Appleton for playing our song The Longest Night on his radio show Shameless Promotion on Ireland-based radio station RadioAktiv! IRELAND, guys! Ottawa was where Scary Bear Soundtrack first formed, and this beautiful city remains my hometown. I happened to be in town during this tragic time yesterday, and it broke my heart to watch my family and friends go through this ordeal. But it also made me proud to watch Ottawa residents support each other, keep a level head, express their condolences to the family of Cpl. Nathan Cirillo, and even go back to work the next day. I love you, Ottawa. We will get through this. In other news, the fine folks at Nova Scotia-based Canadian Beats did an detailed interview about our band, our new album, and our favourite karaoke song. You can read the feature here. If you’d rather listen to me rant about music rather than read about it, Oklahoma’s Almark from We Are the New Underground also did a lengthy in-depth interview with me about my thoughts about music and my influences. 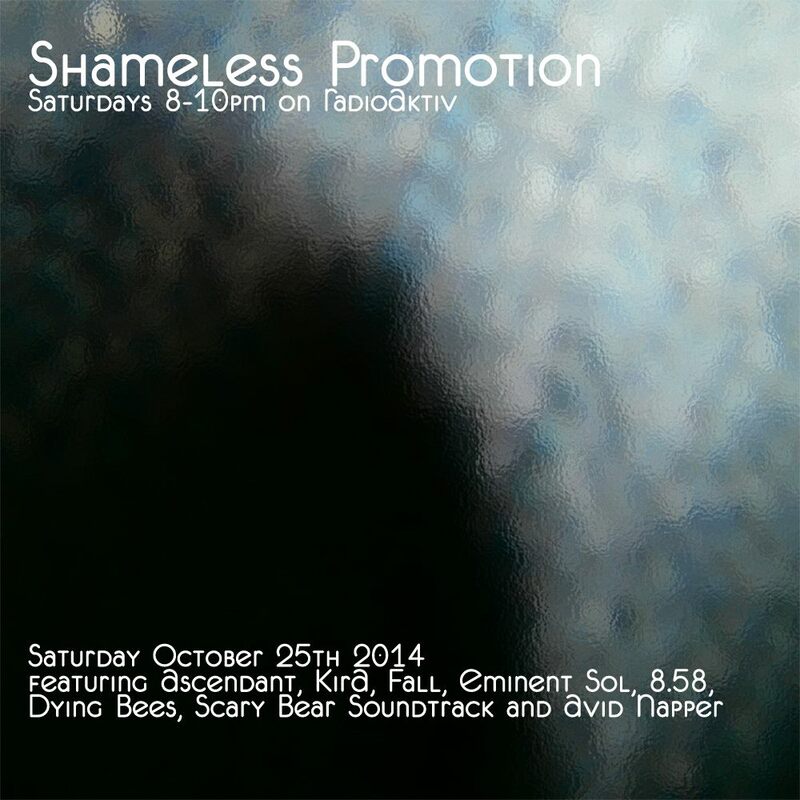 You can listen to the mixcloud stream here. I had a great time last night trying out new songs at Alice’s Village Cafe in the beautiful village of Carp. I got to have some great conversations with folks who have been up north – there are Nunavut fans everywhere! Finally, we are excited to announce a new show! We’ll be performing in Yellowknife at the After 8 Pub, and the show will be broadcast live on Radio Taiga, who is hosting the event. If you’re in Yellowknife, come out! If you are elsewhere, tune in! We’ll also have our album available for sale on CD as well as brand new band t-shirts. We have already received some media coverage in anticipation of this event, including this great article by Denis Lord in L’Aquilon (the first French article written about us so far!). I’m in Ottawa this week! Had a blast performing at the YOW! zine launch at Pressed on Sunday. Big thanks to the crowd for being supportive and giving me a chance to do a zine reading for the first time. showing off my new Blundstone boots – have you checked out the compilation album containing our song The Longest Night? I was also honoured to be at the wedding of original Scary Bear Soundtrack band member Dannik as she married her love Mike at the Chateau Laurier. Congratulations to the beautiful couple! Finally, if you missed my live performance last weekend, this Thursday we’ll be heading over to Alice’s Village Cafe to play at the weekly open mic there hosted by our friend Matt Chaffey of the Split. If you’re in Carp, come say hi! 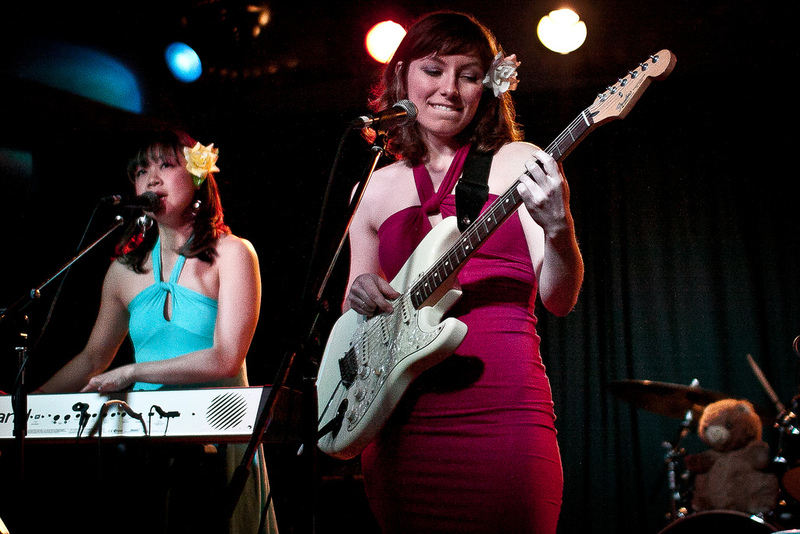 In exciting news, Gloria will be in Ottawa this week…for original Scary Bear Soundtrack member Dannik’s wedding! Everybody send Dannik lots of congratulations! While we’re in Ottawa, we’ll be performing at the YOW! Zine Launch at Pressed on Sunday October 19. And if our plane arrives on time, perhaps we’ll make an appearance at our favourite open mic in Carp at Alice’s Village Cafe? In the meantime, keep voting for our song Fault Lines for CBC Music’s Rock Your Campus contest! We are excited to announce that our music will be featured on a compilation album with other great Canadian indie acts including Said the Whale, Old Man Luedecke, Paper Lions, Royal Canoe and Evening Hymns. You can grab a copy of this awesome mix when you buy a pair of Blundstone Boots at the Australian Boot Company. Enjoy! And don’t forget to vote for us for CBC Music’s Rock Your Campus contest! We had a great time this weekend at our album release party! Thank you so much, Cambridge Bay. Your support means so much to us. It’s not always easy living in a place without conventional concert venues, but we in the North certainly make do, don’t we? 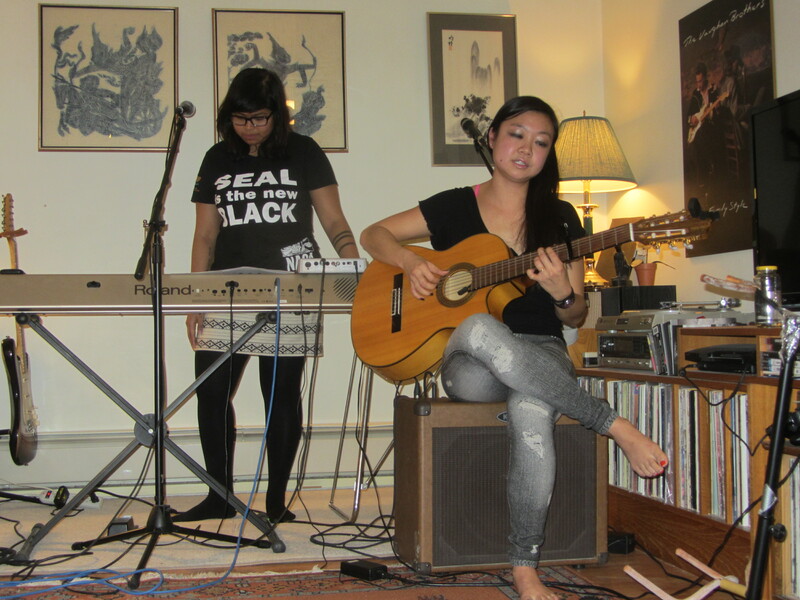 And these house shows are some of my favourite things. and a giant thanks to Kelcey for baking us a Scary Bear cake!! Thank you Frances for taking these photos! In other news, a giant thank you to the Synthpop Show</A? on Britain's A1Radio for playing our song The Longest Night! It is so exciting to be getting some airplay on the other side of the ocean on British radio . Our new album got some love from the media in Greenland. Elias Thorsson, journalist for the Nuuk-based Greenlandic newspaper The Arctic Journal covered our music in a lovely long feature. This is so exciting! You can read the feature article here. We were also excited to hear that we’ve made it to the top 100 acts across Canada so far for CBC Music’s Rock Your Campus contest. Remember to keep voting for us once a day! We’d also like to extend a big thanks to Keith Collier for including our song in his “Songs of the Day” list. 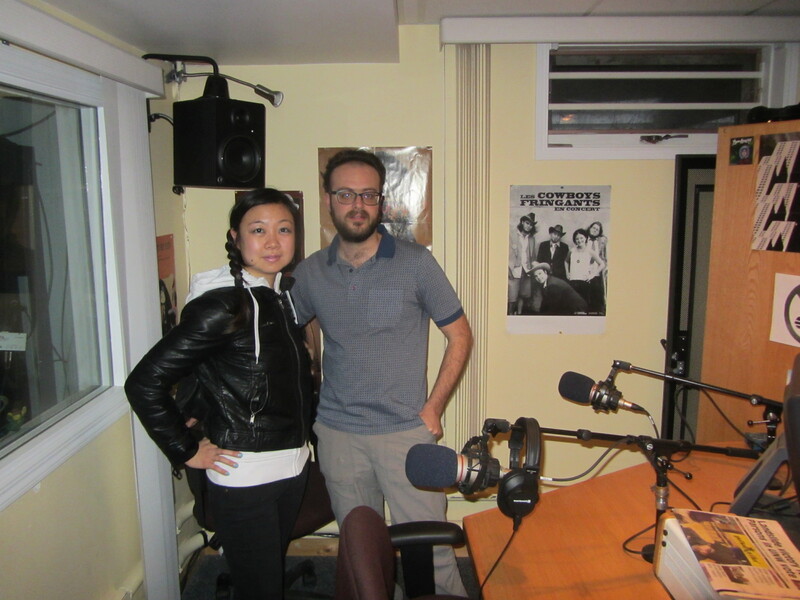 It’s nice to know we’ve got people moving to our music in Arviat! 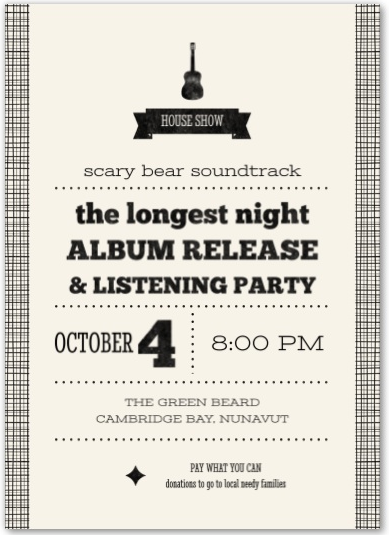 Finally, if you’re in Cambridge Bay, we hope we see you at the album release party tomorrow night!